Successive episodes in the death and burial of Addie Bundren are recounted by various members of the family circle, principally as they are carting their mother's coffin to Jefferson, Mississippi, in order to bury her among her people. As the desires and fears and rivalries of the family are revealed in the vernacular speech of the South, the author builds up an impression as epic as the old Testament, as earthly and comic as Chaucer, as American as HUCKLEBERRY FINN. William Faulkner was born in Mississippi in 1897. A legend of American letters, he is the author of THE SOUND AND THE FURY, ABSALOM, ABSALOM!, AS I LAY DYING, and many other works. He was awarded the Nobel Prize in Literature in 1950, and died in 1962. William Cuthbert Faulkner was a Nobel Prize-winning American novelist and short story writer. One of the most influential writers of the twentieth century, his reputation is based mostly on his novels, novellas, and short stories. He was also a published poet and an occasional screenwriter. The majority of his works are based in his native state of Mississippi. 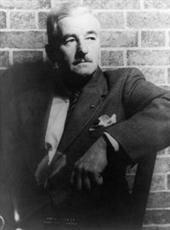 Though his work was published as early as 1919, and largely during the 1920s and 1930s, Faulkner was relatively unknown until receiving the 1949 Nobel Prize in Literature, "for his powerful and artistically unique contribution to the modern American novel." Faulkner has often been cited as one of the most important writers in the history of American literature. Faulkner was influenced by the european modernism, and employed the Stream of consciousness in several of his novels.